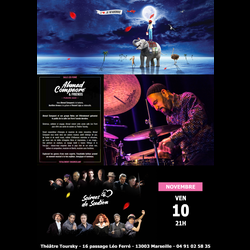 Fusion jazz concert in support of the Théâtre Toursky. Last year, Ahmad Compaoré and his band Nafas have literally galvanised the audience of the Léo Ferré music hall. 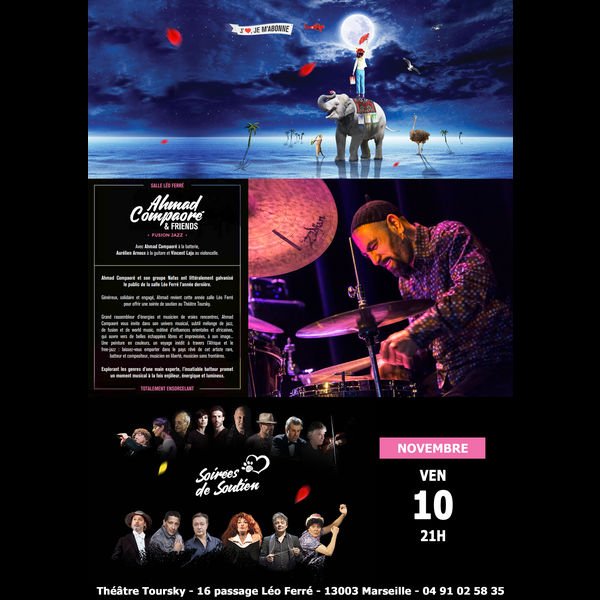 Generous, supportive and committed, Ahmad is back this year to offer a benefit evening to the Théâtre Toursky. A strong leader of collective dynamism and a musician of genuine encounters, Ahmad Compaoré invites us to discover his musical world: a subtle mix of jazz, fusion and world music, sustained by Oriental and African influences, with great detours in improvisation. Like a colourful painting, a musical journey through Africa and free jazz, the starting point of his eclectic career. Skilfully exploring various genres, the insatiable drummer promises a musical moment at once captivating, energetic and luminous. Théâtre Toursky, 16 passage Léo Ferré, 13003 Marseilles.